Obamacare has survived countless attempts at repeal in Congress and two trips to the Supreme Court. President Obama has said his signature health care law is here to stay ... but that may not be true if Republicans take the White House in the 2016 election. Many of the GOP presidential candidates say they'll repeal or greatly revise the Affordable Care Act. 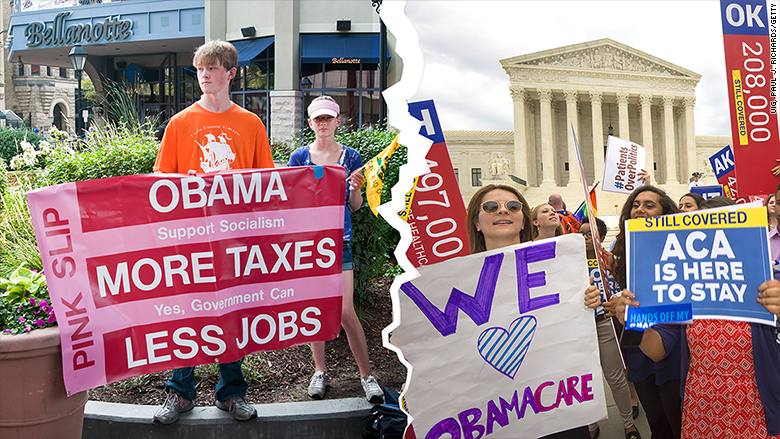 Love it or hate it, there are lots of opinions about Obamacare. Some are true. Many are myths. CNNMoney sets the record straight. 1. Yes, insurance premiums ARE higher under Obamacare. Before Obamacare, individual insurance policies often offered bare bones coverage with high deductibles and many exclusions. Now insurers must offer comprehensive coverage and can no longer deny applicants because of pre-existing medical conditions, both of which have raised the monthly cost. As for annual premium increases for Obamacare plans, they vary widely. Some insurers imposed double-digit premium increases between 2014 and 2015, but others kept their monthly charge essentially flat or even lowered a bit. But since more insurers entered the market, consumers could generally shop around for a cheaper plan. Initial studies of 2016 rates show average premium increases in the mid-single digit percentages, but some insurers want much bigger hikes. 2. But most Obamacare enrollees aren't paying full price. Few people pay the full sticker price of their health plans because of subsidies. Some 85% of the 10.2 million Obamacare enrollees receive federal subsidies, which keep their premiums to no more than 9.6% of their income. The average subsidy in 2015 is $272 a month. 3. Out-of-pocket costs are pretty high, though. Where Obamacare does hit some enrollees' wallets is through deductibles and other out-of-pocket costs. Silver-level plans, the most popular on the exchanges, carry an average deductible of $2,900, according to HealthPocket, which analyzes insurance plans. But more than 57% of enrollees had incomes low enough to qualify for additional subsidies to reduce their out-of-pocket bills. 4. Obamacare is NOT leading to cuts in worker hours. Since employers are required to provide insurance to an employee who works more than 30 hours per week, the fear had been that many employers would cut employee hours to below that threshold. That hasn't happened though. According to an ADP Research Institute report, the share of the labor force working fewer than 30 hours remained virtually the same between 2013 and 2014. Same goes for workers employed 30 to 34 hours a week and more than 35 hours a week. One reason may be that the economy has been improving. Some companies interviewed by ADP said they may increase their part-timers' hours to retain talent and reduce training costs. As to whether employers are cutting jobs because of Obamacare, it's nearly impossible to determine from Labor Department data since the economy is recovering and adding jobs. The number of people who can only find part-time jobs has declined in recent years, signifying companies are hiring more full-time workers. 5. Millions of people did lose their old insurance. President Obama famously said, "If you like your health care plan, you'll be able to keep your health care plan." Those words came back to haunt him in late 2013 when insurers sent millions of consumers cancellation notices ahead of Obamacare open enrollment. Urban Institute researchers estimate around 2.6 million lost their existing coverage. It's likely, however, that they gained insurance elsewhere. 6. Obamacare is helping to reduce the number of uninsured. The uninsured rate among U.S. adults declined to 11.9% for the first quarter of 2015 -- down 5.2 percentage points from late 2013, just before Obamacare went into effect, according to the Gallup-Healthways Well Being Index. That's the lowest it's been since Gallup began tracking the uninsured in 2008. In addition to the 10.2 million Obamacare enrollees, more than 12.3 million folks have joined the Medicaid rolls. Obamacare has helped reduce the number of uninsured to 36 million in 2014, down from 48.6 million five years earlier, according to the federal National Health Interview Survey. 7. Obamacare is raising the nation's overall spending on health care. Health care spending is on the rise, thanks in part because more people have coverage under Obamacare. Spending is projected to have increased by 5.5% last year, the first time the rate would exceed 5% since 2007, according to new federal data. The growth rate is expected to inch up to 5.8% annually between 2014 and 2024, in part because of increased enrollment through the exchanges and Medicaid. It's also because of the rebounding economy and the aging of the population. But Obamacare also contributed to the nation enjoying several years of record-low health care spending growth. Yet health reform also introduced several cost containment measures, including reducing the growth rate of Medicare payments to providers and reimbursing them for treating the illness rather than for each procedure. 8. Obamacare isn't universally hated. Some 43% view Obamacare favorably, while 40% have an unfavorable opinion, according to a Kaiser Family Foundation poll conducted in late June. Opinion is also largely divided along party lines. Some 72% of Republicans want to repeal or scale back Obamacare, while only 17% of Democrats do. Some 52% of newly covered adults said they were better off, while only 11% said they were worse off, according to a May Commonwealth Fund survey, which polled those who obtained a policy through an exchange or have had Medicaid for less than two years. 9. Obamacare raises taxes by $1.2 trillion. There are several new Obamacare taxes, including ones on Americans who remain uninsured, employers with generous health insurance plans and medical device manufacturers. Two of the provisions projected to raise the most new revenue are the additional 0.9% Medicare tax and the 3.8% levy on investment income. Both apply to individuals earning more than $200,000 and couples making more than $250,000. All told, the Congressional Budget Office estimates these measures will raise $1.2 trillion in revenue over 10 years. Health reform imposed these taxes to help pay for expanding health insurance without adding to the deficit.